Remember the old walkmans and boomboxes? The 90s offered some great kid’s music players, but these options have mostly faded away in recent years. 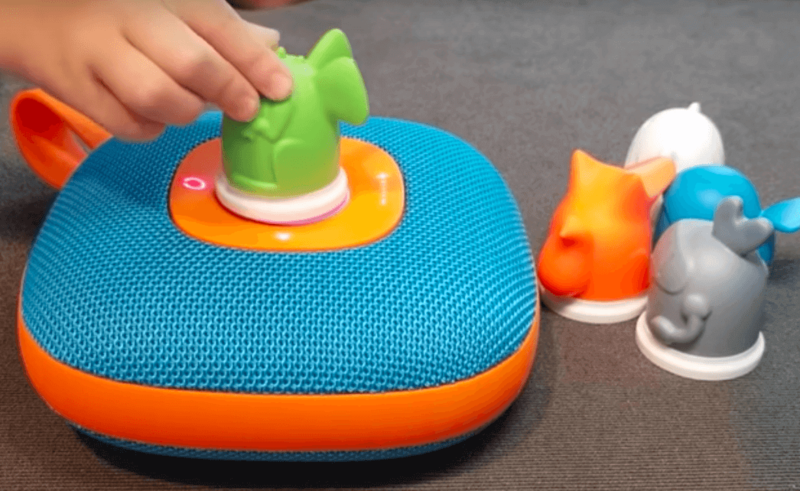 Jooki is looking to bring music back into your child’s life with their smart speaker, if you’re willing to pay for it. Our Jooki Jukebox review will help you decide if this smart speaker is worth it for your kids. Affiliate Disclosure: This page has affiliate links, which earn us commission at no cost to you. The writers of this blog received a free sample of Jooki for review. They were not compensated in any other way. The opinions are 100% their own and not influenced. 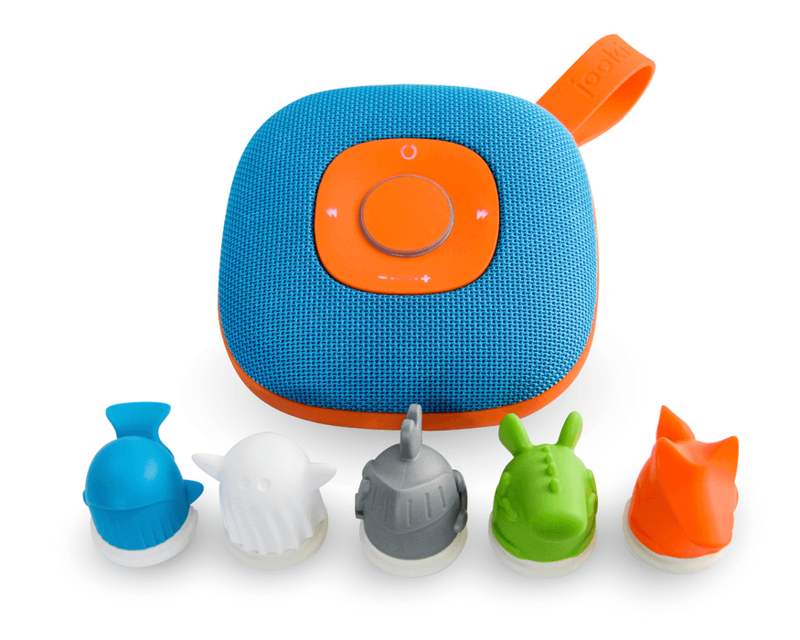 The idea behind Jooki is that it lets your kids control the music, without any distracting screens. Place a token, or NFC figure, on the center of the speaker to play music. Each token corresponds with a playlist that you control in the app. When the child swaps the tokens, the playlist automatically starts playing. I’m not exaggerating when I say my 3-year-old understood how it worked in under a minute of use. Jooki began on Kickstarter and has made waves since at CES (we featured them in our favorite CES gadgets at this link). We recently tested this speaker for our Jooki Jukebox review on YouTube. As you’ll see below, there were quite a few things we absolutely love about this smart speaker for kids. Correction: There are a few things that we found out after our Jooki Jukebox review was published. First, you can secure the tokens by pushing and twisting until they suction on. That’s a huge perk if you’re taking the Jooki to the park or somewhere that the tokens could easily fall off. The suction is impressively strong. Since our review was published, the Jooki shutdown sound was removed, so the speaker quietly turns off. Jooki has also reported to us that they are working on a battery indicator light to help you know when it’s charging. The Jooki app is available on iOS or Android. Alternatively, you can control the speaker using your web browser. Connecting the Jooki to our app was easy. We set it up on our computer, but you can also do it within the app. Just connect to the Jooki hotspot on your WiFi and it will sync the speaker to your app. The app walks you through this set up step-by-step. One of my favorite features of Jooki is how easy they make it to add your own music, either from your phone or computer. I found the web app to be the easiest option for adding music. As a small company, Jooki is motivated to just put out the best product possible, without worrying about how to nickel and dime you. If this same concept was created by a major tech brand, I feel like the tokens would be synced with a library of music that we have to purchase from Jooki themselves. Instead, you can easily import whatever compatible audio files you’d like to the Jooki tokens. Adding music is as simple as uploading music or audio files to your Jooki library, then assigning those files to playlists with a specific token attached. It’s very easy to use, and adding music was never a headache for us. Just make sure your speaker is powered on if you want to add music to the tokens. Once the music is added, it’s ready for playing offline and doesn’t require WiFi. The app also syncs with your Spotify Premium account or web radio stations. As long as you are connected to WiFi, you can play a Spotify playlist using a Jooki token (full tutorial here). I see this being extremely useful for bedtime lullabies, since it frees up your cell phone. Jooki is a standalone Spotify Connect device, so it won’t require your phone during playback. There are parental control options to restrict the volume in the app or turn off Jooki. Soon, you’ll also be able to set up a quiet time schedule when Jooki cannot play music. Jooki’s hardware impressed us. There’s no doubt that you’re paying a big price tag for the smart speaker (see the latest price on Amazon). However, the quality and design matched the price. I feel like Jooki is a kid’s music player we will have for a long time. The speaker is adorably bright and colorful. It is a little heavy—you’re not getting a cheap plastic speaker here. But it’s still not too much for a child to carry. It has a rounded handle attached to make it easy for users of any age to transport. The battery is rechargeable and lasts 8 hours at medium volume. Plug in the USB charging cable to the back for easy charging. The sound is loud and clear; on maximum volume it filled our whole house with our daughter’s favorite music. Jooki has a few buttons: power on/off, next, previous, and volume up/down. When testing for our Jooki Jukebox review, we noticed that the buttons are built in to the speaker and not raised, so it was a little tricky for our 3-year-old. We ended up helping her with any buttons she needed pressed, but I don’t see this as an issue for older children. Memory card. Jooki accepts microSD cards to expand the music library for your kids up to 32 GB. These are not included with the packaging. We tested this with a microSD card and it worked well and allowed us to add more music to the tokens. Splash-proof. This is amazing and feels like a must-have. My kid seems to spill something daily. Headphone jack. Jooki could function as an personal music or audiobook player without blasting the volume for everyone to hear. I think I might hand my daughter headphones and her Jooki on our next road trip. When headphones are plugged in, your Jooki will only play music at the maximum volume that is safe for children. Jooki comes with five plastic tokens for syncing your playlists. These are really cute, well-designed little figurines that keep kids interested (ours loved the ghost). You can buy more on their website, where they also offer flat tokens that are shaped like a coin. Between the five tokens and expandable storage via microSD, the starter pack is completely sufficient for starting out. I didn’t feel like Jooki was immediately trying to up-sell me into buying more tokens since so many are included. Our daughter was able to memorize which token corresponded to which playlist, making it fun for her to be the DJ and change the music or audiobooks as she wanted. We love our Jooki! We’ve used it for music and audiobooks and it’s quickly become a favorite for our little one. She loves that the power is in her hands, and I love that she isn’t snatching my phone anymore. Another interesting feature that Jooki has in the works is voicemail. Within the app, you’ll be able to record your voice and quickly upload that to a playlist. This will be convenient and a fun way to send messages to our kids, especially for parents who travel. For more reading, check out our other baby tech reviews, including the Nest Cam Baby Monitor review and 2018 Baby Monitor Comparison. If you have any questions about Jooki, let us know in the comments below!